The only thing that makes more poo than chooks is ducks. We currently have 6 chooks and 3 ducks on 700 square metres, which poses problems for animal health, smell, flies and managing their valuable excretions for the benefit of our soils. After much observation, contemplation, trial and error, and learning, I have come up with what I think is the lowest effort / most effective system for keeping our birds healthy and our garden beds fertile. I’ll start with the red shavers. These ladies roost in this small storage shed. The free weekly paper is nearly the perfect size for two unfolded sheets to cover the entire floor underneath the roost. These papers provide carbon to balance the nitrogen in the manure when the lot goes into the compost pile. I fork out a depression in the compost pile before putting the “bedding”. 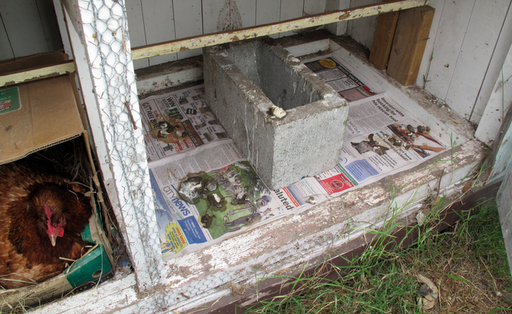 Then I head over to the duck pen where they sleep in a shelter under which I placed a small section of roofing iron. …and with my right hand I can pull out the roofing iron, which has collected a fair amount of their poos over the week. … and use a trowel in the corrugations of the iron to scrape the manure onto the compost pile. The nitrogen in the duck poo further balances the carbon in the newspaper. In order to make sure the newspaper breaks down as quickly as possible, I cover it so that its at the centre of the pile where it remains moist. Then it is back to the duck shelter to replace the iron. Until I repeat the process again next week. I do this every week, usually on Saturday. I feel it is very important to keep this regular to keep the birds healthy and happy. It is the obligation of a bird owner. For our two wee bantams, we tractor them across the grass/clover “lawn” at the back of our section. They eat some grass and fertilize as they go. I shift them everyday. We have noticed a marked improvement in the composition of species making up the lawn: more favorable/palatable grasses and fewer weeds that usually thrive in poor soil conditions. In other words, by tractoring these ladies about our section we are improving the health of our soil organically while they provide us with eggs. Not bad for us or for them. Does anyone else out there have good poo management strategies? Please poost a comment. It just so happens I've seen two ideas in the past week. The first was an article in Organics magazine – a chook house design where the roost is cantilevered, with a mesh bottom and a collection tub beneath (based on the old "privy cantilevered over the moat" castle design).The second was in the Designer's Manual, where Bill Mollison had a similar cantilever but directly over a swale, which would distribute the nutrients. My only reservation would be whether chooks like perching above a draughty opening. We use the deep litter method with bales of peastraw that we collected from a local farm for $4 a bale. Every week the worst bits (under the perch) are removed and put on the compost, or directly on the garden as mulch. A little bit of fresh stuff is added on top periodically. Every few months it's all cleaned out and used as mulch or composted. It's actually kind of amazing how far a bale goes. We got 20 bales this time last year, and we've used only 5 or 6 including a few that went directly onto gardens. The chook house is 4-5m2. Of course the trick is getting it at a reasonable price….